I've wanted to work up some changes on The Creative Side of Me for awhile now, but I've got to be in the mood! After all, change can be both exciting and nervewracking! The blog-changing mood struck last weekend. I've slowly been working behind the scenes and am hoping to go live sometime in the next few days. Bear with me as some things may not look right for a bit. Also, stay tuned for a name change, too! thecreativesideofsteph.blogspot will remain as the address for a short time, but will soon be changing to my own domain name (yay!) as soon as the dust settles...or even sooner. 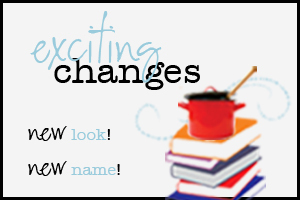 Hopefully you won't notice much change - feeds and emails should still go through, but some of you may need to update your bookmarks (especially so you don't miss new posts and giveaways)! Thanks for staying with me during the upheaval! I like everything but the picture of the books and pot is blurry. Change is fun and exciting. I've been wanting to change around my place as well, but it's not something I wanna do myself! Good luck and can't wait to see what you do. My Kitchen Problem...and a GIVEAWAY!